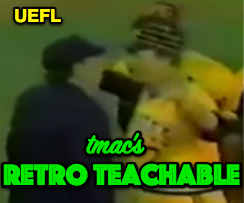 When tmac announced some retro teachable moments late this season, he had no idea there were so many plays our audience wanted to see discussed. Without further ado, let's take a look at this play from a 1979 Braves-Pirates game, as viewed through the 2018 prism. Chuck Tanner's ejection is today's Teachable. Umpiring Differences, 20th Century vs Modern Era: It wasn't all that long ago that if we missed a call, we ate the decision, but that idea just doesn't hold water today. We must get the call right or at least attempt as best we can. Here, we have a pretty basic situation. Pitcher up to bat, runners on 1st and 2nd, one out, so we know in all likelihood we have a bunt situation. The Play: With R1 and R2, and a 0-0 count, the batter squares to bunt and then swings and misses in self defense as the ball hits his shoulder. Should he be awarded first base or charged a strike in this situation? Corner Umpire Thoughts: At this point, what are you thinking as a base umpire? If it's not, "Oh boy we better get the call right," then we have a big problem. Whether or not the batter fouled the pitch off or hacked and missed is irrelevant as either way the swinging batter will be up with an 0-1 count and runners will return to their bases from the 0-0 pitch. Braves batter Phil Niekro swings at a pitch. How to Handle: Here's the way this needs to be handled now: umpires should confer before the dugouts are burned to the ground. Everyone in the yard (who knows the rules) will tell you this is a strike—swinging, foul, dead ball HBP...it doesn't matter...it's strike one either way. 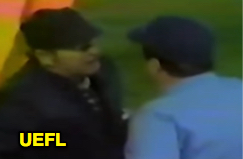 So if you say to the offended manager, "Hey Chuck, go back to your dugout we'll get it right," odds are you won't have a six-minute riot on your hands. Also, when the other manager comes out (which is not a guarantee, even if it's Bobby Cox) you can explain, "by rule we can't give him first base because he swung at the pitch." We'd ideally like to see all umpires involved. A Crew's Ego: I was recently asked "What happens when the calling umpire refuses to change his call even though everyone in the ballpark knows it was the wrong call?" The answer is simple: "Get the call right." If you are the guy that never makes a mistake and can't handle being overruled on a play like this, baseball umpiring is no longer for you. It's no longer about pride or ego, but rather in doing what is right and just. Coaches can't wait to throw umpires under the bus and if both coaches tell an assignor or supervisor the call was missed, who is going to look like a goat? Support and Communication: So let's say we have a brain freeze and don't tell our partner he's not enforcing a swing rule properly. Maybe we all didn't see it. What next? Well we certainly don't allow our partner to get swarmed by the right fielder and four other players. Our goal here is to allow a one on one conversation with the calling umpire and the manager. Once that happens, when we get together, we need to get together with ALL members of our crew. Maybe the guy furthest away saw something or knows the rule. At about the six-minute mark, you get the impression that the third base umpire told the manager that he saw a swing. When the manager tells this to the plate umpire the plate umpire says, "it's my call" and the manager loses his mind and, well, you can watch the video. It appears that the third base umpire tries to give help by running to the plate man and is denied by the HP umpire. Limit the argument by halting, not resuming. Restoring Order: So what happens when the ejected parties refuse to leave the dugout. There's no need to go over and yell, but you can't restart the game. This is a fascinating part of baseball. If you delay the game for a minute or two because the player ejected hasn't left, watch what the other team will do. * They will help you by guilting the person to leave. Heck, sometimes even his own team will tell him to leave. Forfeit, Anyone? And if not, we refer to Rule 7.03(a)(6), which states an ejected person must obey an umpire's order "within a reasonable time." The longer the person disobeys, the worse it looks for them and the better for the officiating crew because as time goes on in this standoff, the original call matters less and less, compared to the gross disrespect shown by the ejected personnel. 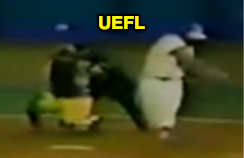 Related Post: ABL - Korea Pulls Team off Field After Manager Ejection (11/16/18). 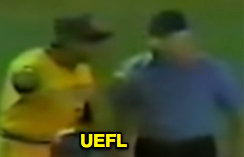 For the record, here are the ejections: Pirates Manager Chuck Tanner by HP Umpire Hank Rountree, Pirates Coach Joe Lonnett by 3B Umpire Ed Norris. *The Pirates protested the game after this play, claiming Niekro swung at the pitch such that the rule was misinterpreted. After the inning, with Lonnett still in the dugout, Braves skipper Bobby Cox protested the game for the umpire's failure to enforce the expulsion of Lonnett. Conclusion: What have we learned here? Know the rules. Prevent situations from turning ugly by getting the call right and if you can do it in a timely manner, even better. Don't eject someone and leave him in the dugout. As always, have fun out there and Happy Umpiring.